Clinical Notes: What is a J-point elevation? J-point is the point at which the QRS complex meets the ST wave. 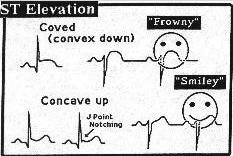 ST segment elevation with an upward convexity is usually benign, especially when seen in healthy, asymptomatic individuals. ST segment elevation with a downward concavity is more likely to be due to acute coronary syndrome. Although ST elevation with an upward concavity and J-point notching often reflects a normal variant, this is only true if the patient is asymptomatic. The same ST pattern in a patient with chest pain is due to acute coronary syndrome until proven otherwise. J-point elevation, ST-segment elevation, and T-wave changes are reported with high frequency in athletes. When examining the ST segment, focus on elevations or depressions 0.06 seconds after the J-point (since the ST segment can at times be sloping). ECG Web Brain is a useful online and iPad/iPod reference (no longer free, $15 per year). Thank you! I was a volunteer for a research study and while they took an EKG the guy freaked out, and made me really scared telling me I had an ST elevation and T wave elevation and that meant I had/was having/or about to have an MI. I am only 25 and was a collegiate athlete, and I feel fine. A doctor looked at it, and turns out it's only a J point elevation- whew! Very unprofessional of the guy administering the EKG. Same thing happened to me during a physiology class! TA was at a loss for words and scared me for sure. I'm on my own trying to pin down what is up with my ECG read-out for our class assignment, but ST elevation surely fits. I agree that the guy was alerting you of something I had on occasion difficult to make a differential without further study. And I was chairman of the department of Family medicine, Board Certified in three specialties (Emergency Medicine, Pain Management and Disability Analysis), and on top of that trained for seven years by the American Board of Surgery in thoracic and vascular surgery. I would rather that he tells you what he had in mind instead of just negreting it. I would send him a chrismas basket instead of faulting him. I love the smiling face and the frowning as well. What would you rather have him do? Do nothing and he had missed something and you die from a heart attack (then he'd really have been unprofessional) or he bring it to the doctors attention and it turn out to be not be as bad as originally thought. I would prefer to have it analysed than nothing done at all. You're right that he should NOT have lost his composure but he did make the right call. "at least you've learn something that sometimes even the professionals have hard time telling the differences"
ST elevation is usually the tell tale sign of an acute MI if in two or more contiguous leads. EKGs have a whole lot of variables to them and it's part science and part art interpreting them. I'm studying for my Cardiology test as part of my Paramedic class, and I was never taught that "athletes may have ST elevation." Very interesting.